The company was established in 1925 by Paul Abesser and Ernst Merkel (1907-1960). 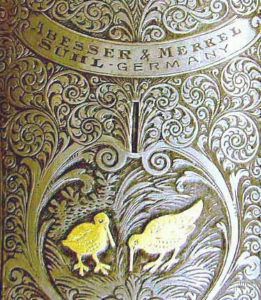 They were both Master Gunmakers and Ernst Merkel already founded his own gun making company in 1920.There were quite a few gun makers with the name Merkel in Suhl, the most famous of them the founders of “Gebrüder Merkel” (Merkel brothers) and their family members that followed. The Ernst Merkel at Abesser & Merkel was not related to this family. At this time we do not have much information about Abesser & Merkel. The company specialized in high end highly engraved and carved Shotguns, Drillings and Sporting Rifles that were made to order. In the very informative book “Gebrüder Merkel – die Jagdwaffe in meinen Händen” by Dr. Fritze it is suggested that Abesser & Merkel tried to reap benefits from the good reputation of the Gebrüder Merkel Company that was represented in America by the well known Stoeger Company. 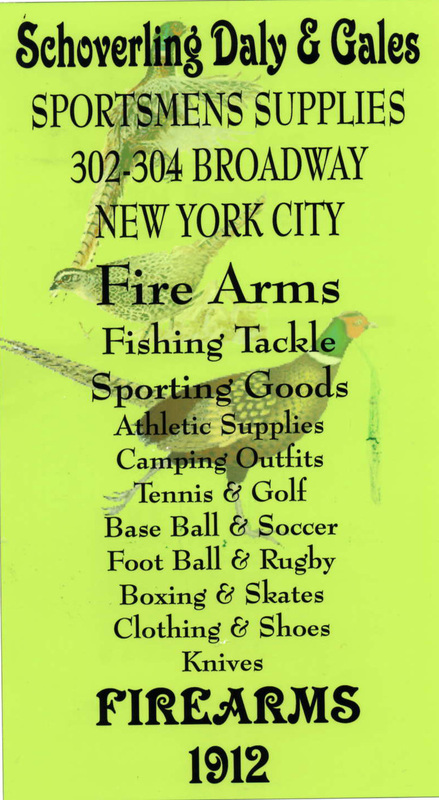 The Sloan’s Sporting Goods Company in New York City was for a time the representative of Abesser & Merkel. Like Charles Daly who had imported guns made by Lindner in Suhl before World War I that became known as the Prussian Dalys and had enjoyed great popularity, Sloans apparently tried to do the same with Abesser & Merkel guns, but can’t have sold many guns. 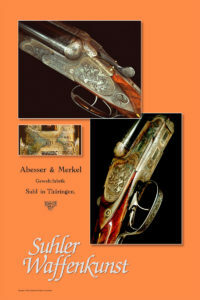 We believe that Abesser & Merkel had various highly skilled gun makers and engravers in Suhl work for them in their own shops just as Lindner had done. 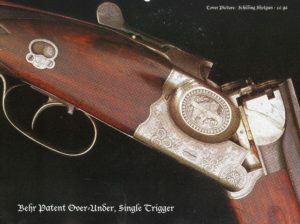 After the First World War Lindner was no longer in business, and the Schueler Company in Suhl now made guns for Charles Daly. Since America enjoyed very prosperous years that became known as “the roaring 20th.”, but the gun makers in Suhl had never overcome the difficult years after the War was lost, they needed work badly and tried to find customers in America. One well known Suhl gun maker brought a bunch of guns with him to New York by Ocean Liner and made them available for clay bird shooting from the deck during the crossing. He was then able to import them as used guns, paying less or no duty and supposedly sold them for very low prices. But all this came to a shocking end when the stock market crashed in 1929. 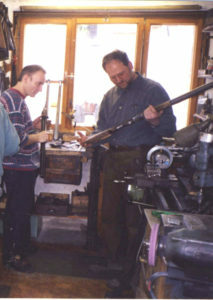 For almost two hundred years members of the Adamy family made guns in Suhl, formerly also under the name Lützelberger. 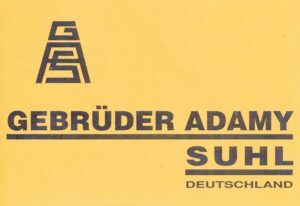 The Gebrueder Adamy Company (Adamy Brothers) was founded in 1921 and continues to make fine guns under Helmut Adamy and his son Sven, the seventh generation of gun makers. They can make most of the guns Suhl became well known for. 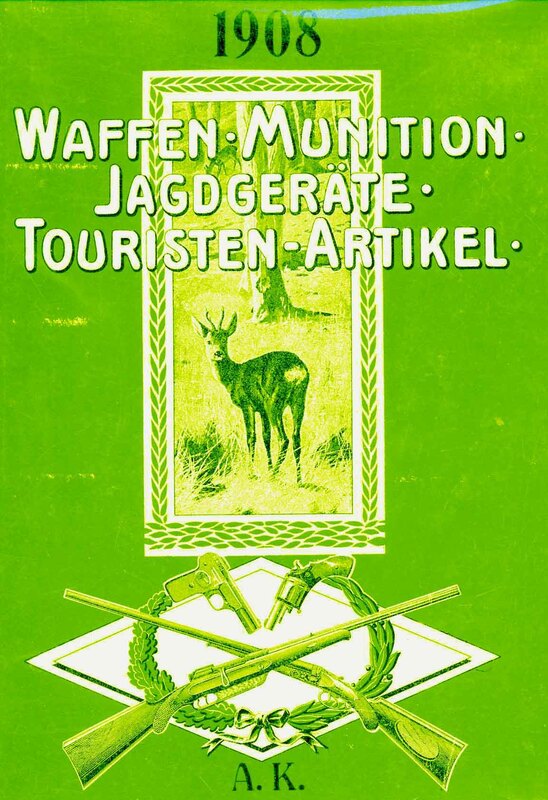 During the years of Russian occupation and a Communist Government their guns were marketed by the BüHag(Büchsenmacher Handwerk Genossenschaft), a cooperative for the smaller gun shops. The Master Gunmaker Helmut Adamy served as the head of the German Gunmakers Guilds in Suhland vicinity for years, and also for Thuringia and other States in Germany. The Gun Makers Guilds are responsible for the education of gun makers and their certification as journeymen and as masters. 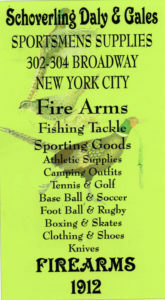 Before World War II Sloan’s Sporting Goods Company in New York was the sole United States Agent for the Adamy Company. The story of an Adamy Drilling, photos of a pre-war gun and catalog pages are in our Archive (Nr.5 –T). Adolph, Fred – Fred Adolph grew up and learned his trade as a gun maker in Germany. 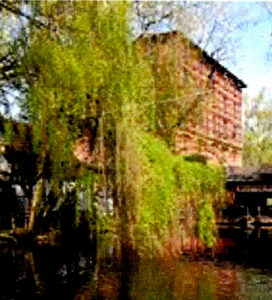 He came to America and established his own business in Genoa, New York early in the 20th Century. 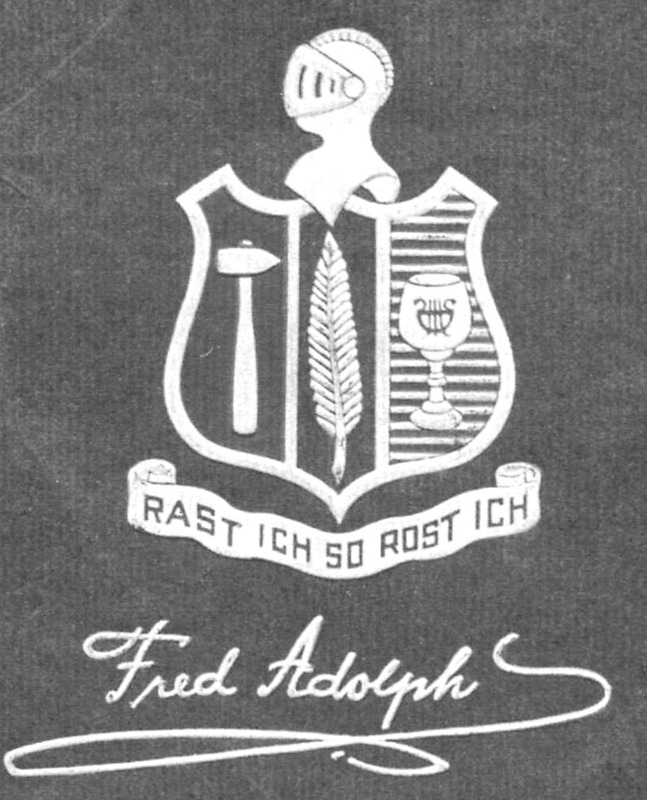 For more reading, find an article about Fred Adolph in our Archive. This company was founded in and was and still is as a dealer, a distributor, an importer, an exporter and a manufacturer. Bring up more information in our archive click on the underlined name in blue. More information, articles, and photos can be found in our Archive. Ansorg, Gun Makers in Zella-Mehlis. 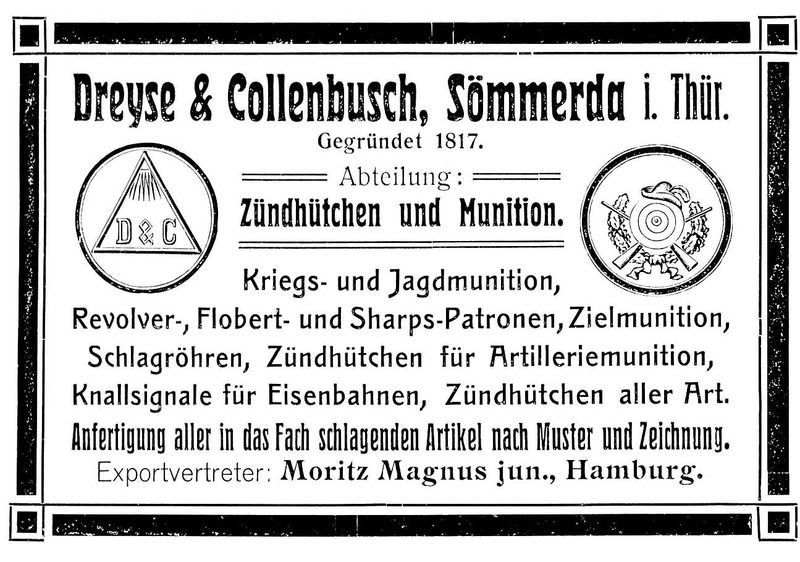 There were many gun makers with this last name in Zella-Mehlis, and with have an article with good photos of a hammer gun by J. Ansorg in Wuerzburg. We don’t know whether he had any connection to gun makers in Zella-Mehlis. you will find the list and an article and photos of one gun in our archive by clicking on the underlined name in blue above. 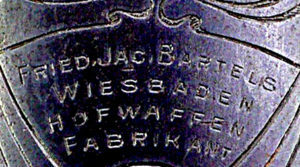 Barella – Heinrich Barella (1819-1893) is most likely the founder of the company named H. Barella Gewehrfabrik GmbH in Berlin at Friedrichstr.25/26. At the same time they also had a shop at Molktestr.1 in Berlin. In 1914 M. Barella, Kgl. Hofliefernat is listed at Französische Strasse 24 in Berlin. In 1920 the company advertised a small bore target rifle. 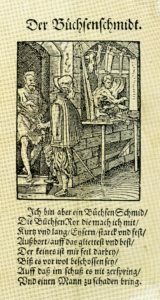 Carl Heinrich Christoph Bartels lists himself as a gun maker in Wiesbaden, but his guns were made for him in Zella-Mehlis in his own shop or by other makers. Bartels & Büttner was most likely a branch in Franfurt. This business was taken over by barella in Berlin in 1930. Burkard Behr was a prolific inventor who held over 52 Patents related to Firearms, Ammunition, Artillery, Signal Flares, an electronic signeling system for Hotels. He was lited on the US Patents as being a Citizen of Russia and at one time or another resided in Hamburg, Bremen and Suhl. He developed a hinging system for Over-Under guns that has been adopted by several other well known makers since. Little is known about the man and his Company. To read more go to Behr, Burkard & Behr’s Waffen-Werke in the archives. Well known among hunters, he is celebrating the 25th anniversary of his business which he founded in 1883. His reputation as a Gun Maker, Taxadermist and Antler Specialist made him famous all over the world. 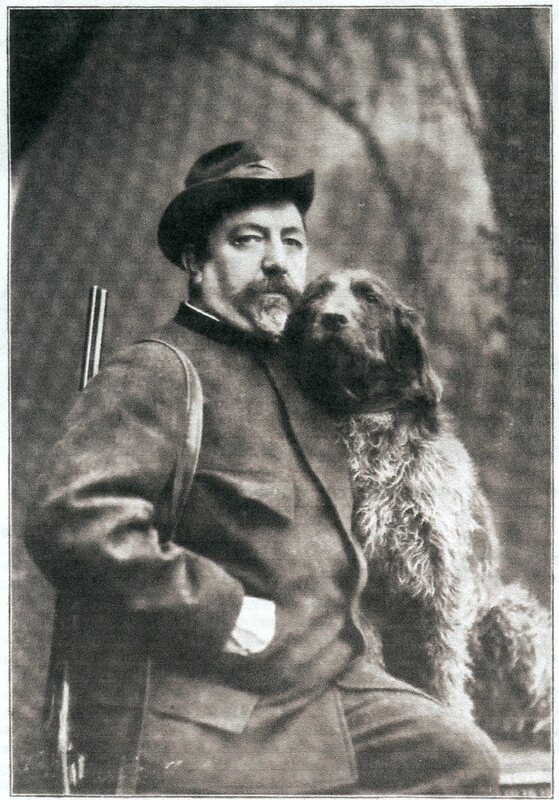 In 1883 he drew the attention of the canine club Hektor for exhibiting stuffed animals so realistic that he was honored by the judges with a medal, which has never before been bestowed on anybody. Otto Bock was responsible for the progress in Dermoplastic we know of today in Germany. The beginning of his work in Taxidermy, his writings and studies are now preserved at the Royal College in Berlin, which he attended. His personal collection of Eggs from German Birds of Prey, now in private hands is one of the most valuable biologic achievements in Germany especially since Otto Bock collected these eggs himself climbing many trees and rocks. His interest in animals and specifically in Taxidermy attest for his expertise and workmanship he produced but his greatist achievement was in the production industry of hunting firearms of the last 20 years. An avid hunter himself, having friends like Capt. Roth and co-worker Paul Stadelmann, Suhl, his knowledge earned him fame worldwide. 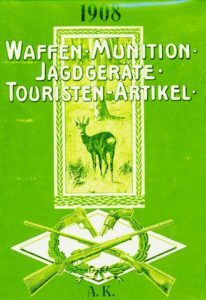 How important his production of large caliber (9.3mm) Doppelflinten was, can be read in various Hunting Publications and attested to by German Big Game Hunters. Otto is now 52 years old, married, father of three sons and two daughters. One of his sons is also named Otto and is expected to step into his fathers foot steps. The picture shows Otto Bock with his loyal hunting companion “Heiko” . Interpreted by my good friend George Brinkop. Click Here to go to the Otto Bock page. Wilhelm Brenneke (1865-1951) Inventor of Guns and Ammunition, and Prominent Gun Dealer founded the Wilhelm Brenneke Gewehr-und Geschossfabrik in 1895 in Leipzig. In 1917 and 1921 he lost his two sons. 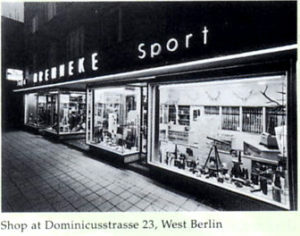 The Company moved to Berlin in 1951. After Wilhelm Brenneke passed away in 1951, his daughter, Elsa Brenneke, managed the company. 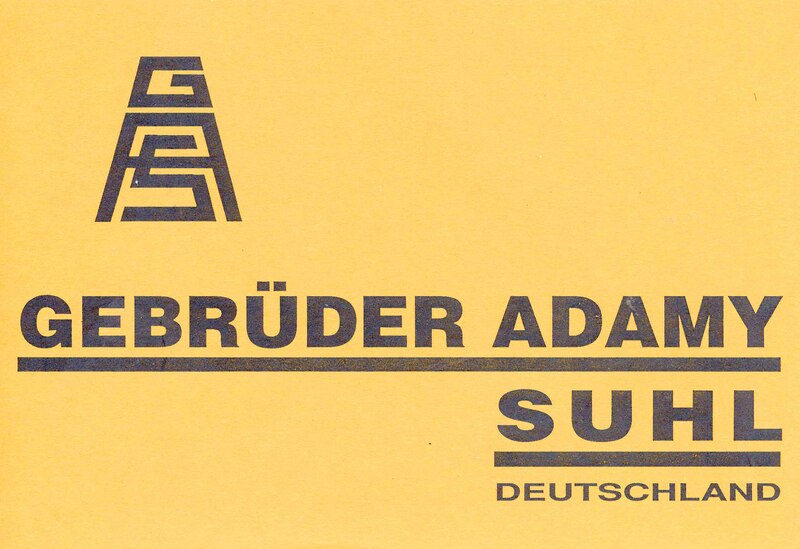 In 1971 the company moved to Langenhagen near Hanover. In 1973. Waltraut Mank, the daughter of Elsa Brenneke, joined the company and became its manager in 1975. Her son, Peter Mank, assumed the management of the company in 1980. At the founding of the company a branch in Suhl was listed, a gun making facility under Konrad Heym where all early Brenneke guns were made. It was closed after 7 years, but Brenneke guns were still made in Suhl for years to come by a few Suhl gun makers. Among them was one of the Merkels and E. Schmidt & Habermann (ESHA) and perhaps others. As we find conclusive information, it will be added later. All Brenneke guns were very well made, and some had very unique bolting and safety features which are explained in articles you will find in our archive. Although the listing on this page is very short, much detailed information can be found in our archive. In 1995 the Company celebrated its 100 year Anniversary and brought out a publication with the detailed company history with many photos that you can find in our Archive (Nr.86-T). In the same publication you will also find a detailed history of all Brenneke inventions and developments with quite a few photos in our Archive (Nr.87-T). Several feature articles about Brenneke and his guns make interesting reading and can also be found in our Archive (Nr.88-T). In a Photo Gallery you will find additional interesting photos of Brenneke guns and other material, in our Archive (Nr.43-PG). A Cooperative of the Gun-making Trades If you have a gun which has the word “BÜHAG” or “Bühag” on the top rib or in other locations, it is a gun that was made after World War II, in one of the remaining small gun shops in Suhl and Zella-Mehlis. in the DDR (Deutsche Demokratische Republic), founded in 1949 under a Communist Government. They are good quality guns made by skilled craftsmen and some them engraved by the best engravers that worked in their own shop at their home. They might in the future have additional historic value.When Russian troops came to Suhl after the end of World War II in June 1945 they right away took over all the major factories in Suhl and Zella-Mehlis from the American Army. Russian military officers had guns made for them shortly thereafter, but soon all gun making was strictly controlled. The first officially ordered work was the cleaning up the best machines in the factories and crating them for shipment to Russia as war reparations. Many streets were lined with the crates, and since all second railroad rails had been removed, transporting these machines to Russia took quite a while.You might suspect that the Russians wanted to stop all gun making, but quite the opposite is true. They were very interested in having many guns made as war reparations (1946 to 1951), for export to countries under their control and other countries. When the DDR under a communist government was established, all major and most mid-sized companies became the property of the State, called “Volkseigene Betriebe”, translated “Companies owned by the people”.Only the small shops with few employees were not taken over, but they all had to be members of the “BÜHAG” which was controlled by the Communist Government. This included independent gun makers, actioners, barrel makers, stock makers, polishers, engravers and all other specialized craftsmen. This was their only way to make a living.The Bühag accepted all gun orders, supplied all machined gun components that were made by the bigger factories and also stock blanks. Purchase prices for these components and the prices paid to the craftsmen, as well as the final sale price of a completed gun were set by the association and an export office, just like all industry and commerce was regulated by the government. An export office in Berlin handled the sales to other countries and accepted all payments. Hard currency was of particular interest, and some guns were sold for less than what it had cost to make them, to just get this hard currency. Very few guns were exported to the United States because a very high import duty was charged on merchandise coming from behind the iron curtain.At the beginning of World War II there were 450 independent small gun makers in Suhl. 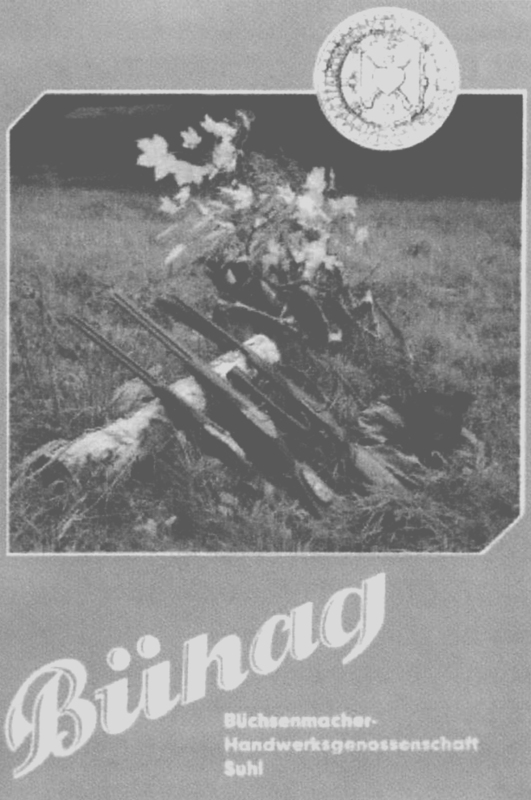 When the Bühag was formed in 1949 only 53 small gun shops remained. Some of the guns they made were models that were advertised and shown at gun shows, but special orders for custom built guns were also accepted.A side-by-side shotgun made by Franz Jager for his son Paul Jaeger in America is an example not only that special order guns were made, but also that the guns were of guaranteed quality. 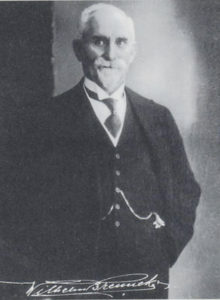 Franz Jaeger employed 50 gun makers in 1914 at the beginning of World War I.He was not only a good craftsman, but also an inventor and manufacturer of guns with a high reputation. Although up in age, he still worked in his remaining gun shop with one actioner, Mr. Triebel, and one stockmaker, Mr. Günzler. to have an income. 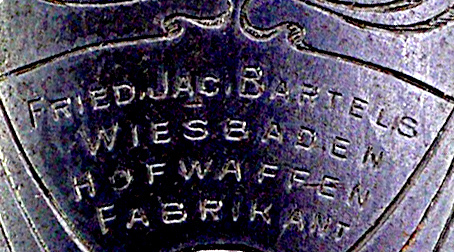 This confirms that most of the guns that are marked with the word BÜHAG are very well made guns. All guns also had to pass an inspection by a government agency and the markings on the rear hook in the second photo of the gallery were added after the gun had been inspected. You find photos of the Jaeger gun in our Archive (Nr. 50-PG).After the unification of Germany the Bühag existed for a few more years and a travel group of the German Gun Collectors Association was at their exhibit at a gun show in Suhl. Because market conditions had changed and the small makers could no longer get various machined gun components from the only remaining Merkel factory that changed hands several times, the Bühag went out of business in December 1949 and the remaining small makers were on their own. You will find the listing of a few in Section 5, and the listing of others will follow. As the list in our Archive of gun related companies that were located on Broadway in New York City shows, Schoverling Daly & Gales was among this long list one of the most prominent one.Their 1912 mail order catalog with 260 pages shows that they carried a great assortment of guns.More information, articles, and photos can be found in our Archive. Dreyse was born in Sömmerda (then ruled by the Archbishopric of Mainz), the son of a locksmith. Dreyse worked from 1809 to 1814 in the Parisian gun factory of Jean-Samuel Pauly, a Swiss who designed several experimental breech-loading military rifles. Returning to Sömmerda, he in 1824 founded a company to manufacture percussion caps. It was there that he designed the needle rifle. 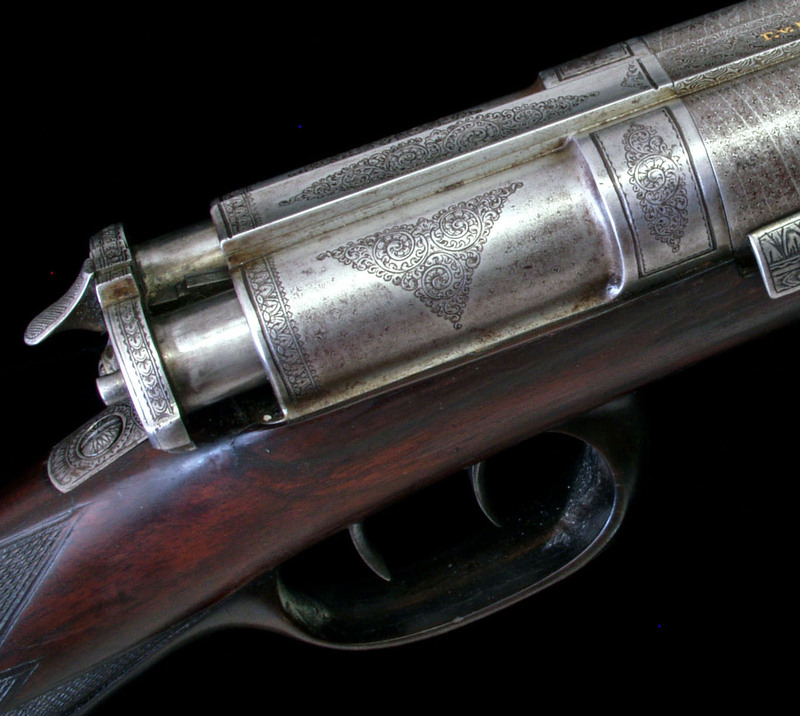 A muzzle-loading model of 1827 was followed in 1836 by a bolt-action breechloader, which the Prussian army began to purchase in 1841. The high rate of fire of Dreyse’s weapon overwhelmed enemy troops in the 1864 German-Danish War for the territories of Schleswig and Holstein, earning Dreyse papers of nobility from the emperor, indicated by adding the “von” ahead of the last name. The Dreyse rifle was the standard Prussian infantry weapon until the ascendancy of the Mauser riflein the 1870s and ’80s. While the gun is thought of by some to be the first bolt-action rifle, in reality it bears little resemblance to modern bolt-action rifles, except for the bolt principle itself which was applied to close the breech. 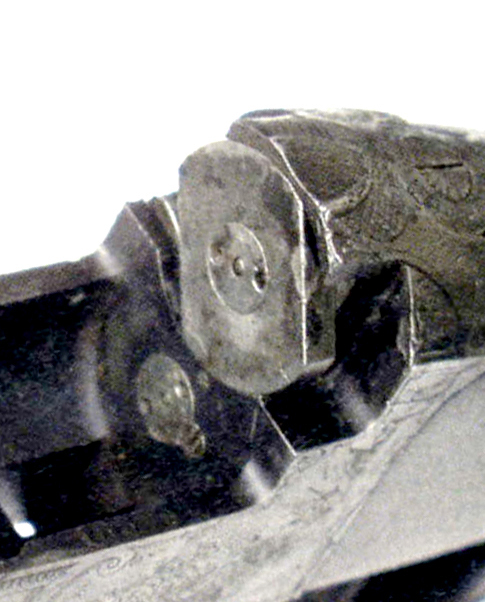 Ammunition for the Dreyse rifle was made up of paper cartridges holding the bullet into a sabot. The gun’s needle penetrated the paper cartridge before igniting the black powder charge. 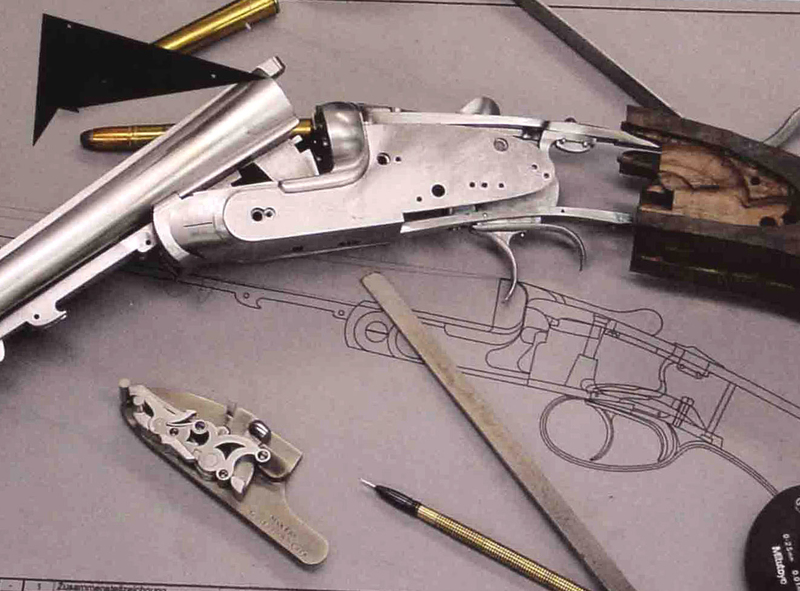 The Dreyse’s simple construction made it relatively easy to keep clean and in operation. For instance, worn needles could be quickly replaced without dismantling the bolt mechanism. The Dreyse rifle was a significant ordnance improvement for its time, since it permitted a much faster rate of fire than the muzzle-loading rifled muskets which were the standard of world’s armies until the mid-1860s. It also enabled riflemen to reload without standing and exposing themselves to fire. 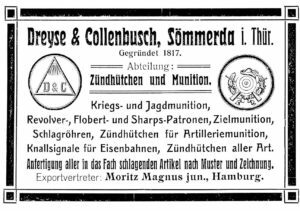 With the help of the Prusian State Dreyse built a gun and ammunition factory in1841.. After Dreyse created the needle-gun, he dropped the Johann part of his name and was known as Nikolaus von Dreyse. The factory founded by Dreyse and continued by his son Franz (1822–94) became part of the giant Rheinische Metallwaaren- und Maschinenfabrik AG of Düsseldorf in 1901 (now Rheinmetall GmbH), a major supplier of weapons to the German military. Upon his death in 1867 Rudolf Franz Karl von Dreyse (1822-1894) took over the management of the company. 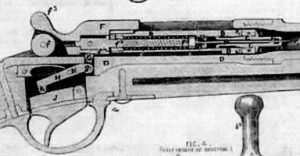 He not only improved the Zündnadel ammunition several times, but also received a patent for a revolver with case ejection. He was succeeded by his son Nicholas John von Dreyse, but in 1901 the factory became the Rheinische Metallwaren and Machine Works, later Rheinmetall Werke Department Sommerda. military rifle would soon be overtaken by other designs. He did bring out hunting models and even side-by-side double barrel shotguns with the same firing mechanism. His sons, Franz von Dreyse and Nicholaus John von Dreyse made hunting guns of different designs..
You will find photos of original Dreyse rifles, Dreyse hunting guns as well as drawings of the mechanisms in our Archive (E-2 Nr.4) The last two pages show photos and an article about a needle fire rifle made by the gun maker Joseph Dörsch in Suhl. What makes this rifle so very interesting is the fact that the bolt locks directly into the barrel, as the photo on top of the article shows, just like on today’s bolt action hunting rifles. More information about this and the whole history of bolt action hunting rifles can soon be seen in Section 6 under Bolt Action Rifles. This family of gun makers upholds the German gun making tradition although they served their apprenticeships in Ferlach, Austria. Their served his apprenticeship under his father and just recently became a Master. They built gund from scratch on a few old machines formerly from a maker in Suhl and on the most modern equipment. Read more about their guns and their history in our Archive. 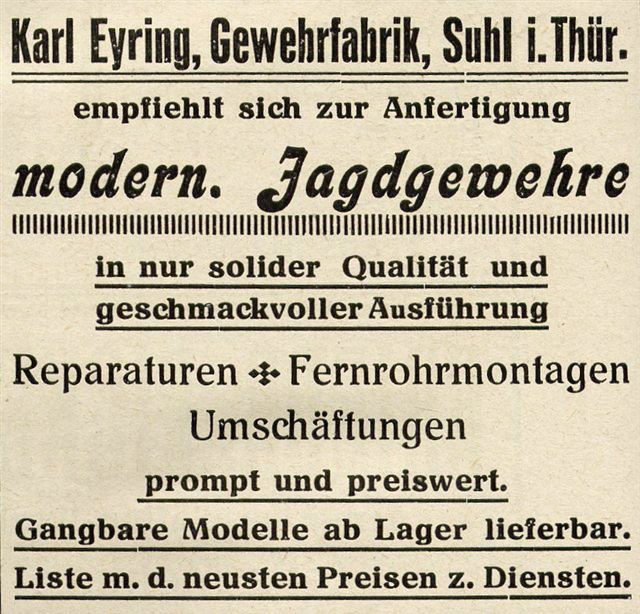 An article in a recent issue of Deutsches Waffen Journal with the title “Vergessen”, tranlated“Forgotten”, by Peter Danneker brought the motivation to add Karl Eyring to our list of gun makers. 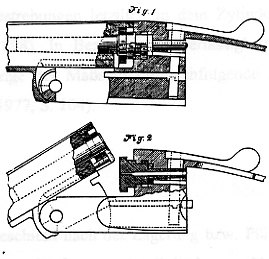 I had already written about a double rifle with Eyring’s patented bolting system in 1906 in the GGCA Journal Nr.30. Although I have colleted all information I could find about Eyring and his guns over the years, very little is known about him and the factory in Suhl that is part of the advertising on the right. One reason is perhaps the fact that he was only 42 years old when he did not survive a heart attack in 1924. 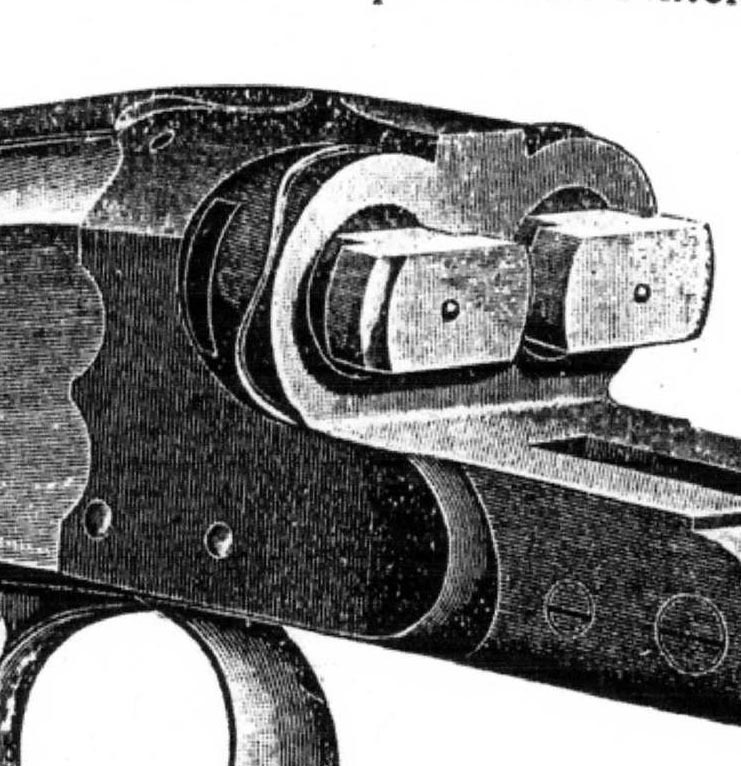 It is his patent and his guns with the unusually strong bolting mechanism for break-open guns that are of interest to those who study the development of German hunting guns. The drawing and the photos on the right and in our archive show clearly what the Eyring invention is all about. 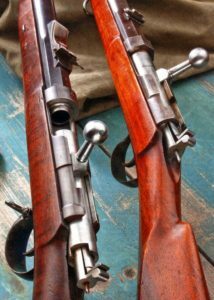 The rotating breech plugs that have proven their value on many bolt action rifles seal off the barrels behind the chambers and take up all pressure created by the firing of a cartridge. For this reason the breach ends of the barrels had to be somewhat bigger in diameter. 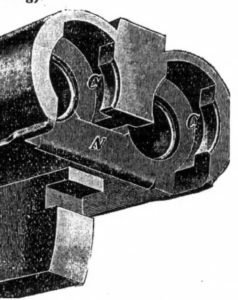 There is no doubt that this is a very strong bolting system, but one must wonder whether the linkage from the rotating breech plugs to the top lever would work easy and reliable enough. 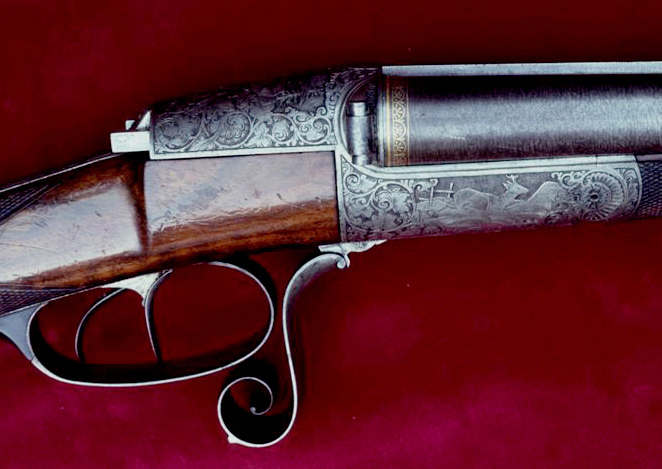 Although this is a very interesting invention, it was never very popular and most likely only very few Eyring guns were produced. The guns that came to our attention were mostly side-by-side double rifles and one three barrel gun, mostly with the heaviest rifle calibers that were available at the time. The inventions of stronger bolting systems was driven by the new smokeless powders that developed much higher pressures, and gun makers competed by claiming that they had the strongest actions. 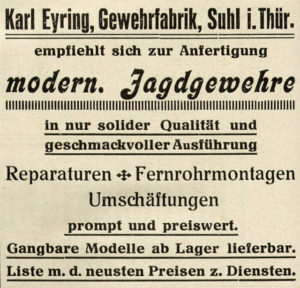 The Eyring patent was granted in 1908 and the Jaeger Vertikal Block Verschluss, better described as a tilting block action, already in 1906. Both were considered very strong actions but both were very costly to make. The Jaeger invention does not depart from the traditional appearance of hunting guns, while the Eyring, when opened, looks so very different. 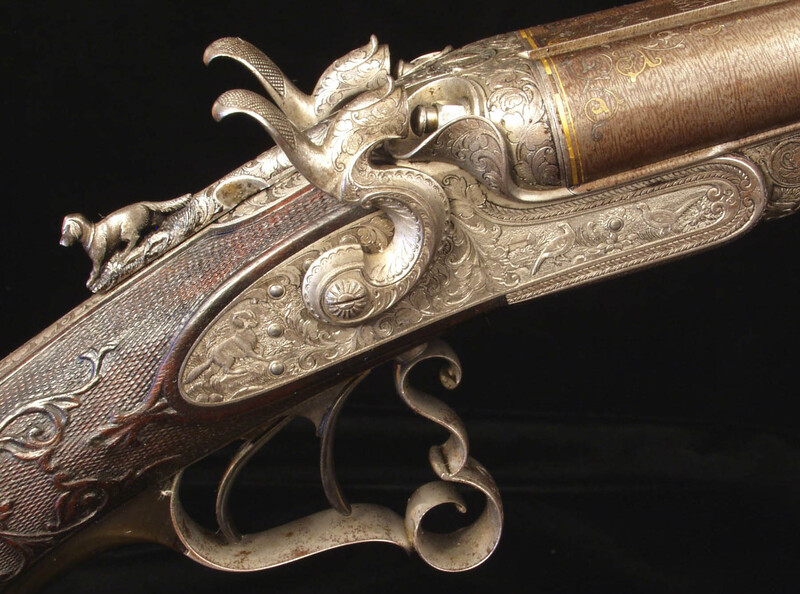 Tradition always played a major role when choosing a gun and still does for the gun collector. In a letter written in 1911 by Franz Kettner, a former prominent gun maker in Suhl, he answered the question why he had purchased an Eyring three barrel gun with the statement “I like to see what is new because there is always something to be learned”. Not only did he learn from it, but he came out with an over and under gun that used the Eyring rotating breech bolt for the upper barrel only while the lower barrel still depended somewhat on the traditional barrel hook and hinge pin. Information and photos for this article came from Axel Pantermühl, from an article by Peter Dannecker in Deusches Waffen Journal, from Kent-Ake Salomonsson and others. Photos of guns with the Eyring invention and the patent documents are in our Archive (Nr.33–PG).